He was among the first arrivals at the ITER Joint Work Site in Cadarache, France, more than eight years ago, but his involvement in ITER dates back to 2001 when he became part of the French team preparing the candidature of the Cadarache site. This is why Akko Maas, engineering officer, probably knows more about the "making of" ITER than any other ITER staff member. The story he shared with colleagues at a Science and Technology Meeting on Monday 30 June was not the official history, but a recollection of facts, conversations and interpretation of documents. 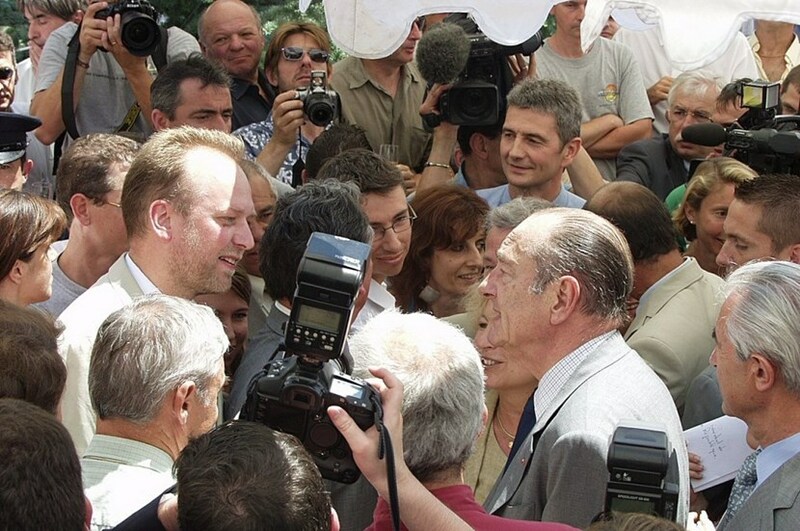 On 30 June 2005, President Chirac of France came to celebrate the Members' unanimous decision to built ITER in Cadarache. Akko Maas (at left, speaking with the President) was on the front line, having organized the logistics for the presidential visit in less than 36 hours. It all began in 1985, at the Geneva Summit between USSR General Secretary Gorbachev and US President Reagan where—thanks to the intense efforts of Academician Evgeny Velikhov and Dr Mike Roberts—fusion research was on the agenda and the two leaders emphasized "the potential importance of the work aimed at utilizing controlled thermonuclear fusion for peaceful purposes" and advocated "the widest practicable development of international cooperation in obtaining this source of energy, which is essentially inexhaustible, for the benefit for all mankind." Two years later in 1987, at the first meeting of the Quadripartite Initiative Committee under the auspices of the International Atomic Energy Agency (IAEA), the birth of the International Thermonuclear Experimental Reactor (ITER) became a fact. In those early days, only four members—Europe, Japan, USSR and the US—participated in the initiative and went to work on the first conceptual design activities (CDA) which were completed between 1988 and 1990. In 1991 the negotiations for the engineering design activities (EDA) started and three Joint Work Sites were opened in mid-1992 (Garching, Germany; Naka, Japan; and San Diego, US) to facilitate and speed up design work. In 1998, after the Final Design Report was approved, the US announced they would not join the following phase and left the project. Work continued on a design option with reduced technical scope and cost and in early 2000 the time was deemed ripe to start exploring, among the interested parties, what it would take to build, operate and decommission ITER. Canada was the first nation that offered to host the project, quickly followed by Europe and Japan. In 2002 negotiations picked up speed and the following year the US re-joined ITER and China and Korea also became part of the negotiations. For the next several years negotiations evolved mainly around issues such as organizational structure and staffing, information and intellectual property rights, non-proliferation and peaceful uses and, of course, site selection. Initially four sites were proposed: Clarington (Canada), Rokkasho (Japan), Cadarache (European Union/France) and Vandellos (European Union/Spain). In 2003, after being asked to propose only one site, the European Union selected Cadarache, France. The same year, Canada withdrew its offer. On 28 June 2005, after more than four years of long and complex negotiations, the Cadarache site in southern France was finally selected to host the ITER Project. Kaname Ikeda from Japan was appointed Nominee Director General, the Joint Work Site in Cadarache was opened and a seventh Member, India, joined the project. As the first ITER staff started to arrive in Cadarache, the ITER Agreement, establishing the ITER International Fusion Energy Organization, was signed in Paris on 26 November 2006. After more than 20 years of preparations and negotiations on paper, the Agreement opened the way to finally start the digging, building and manufacturing to make ITER a reality. "And the rest is history," says Akko Maas. "I hope that I have helped you to better understand how we have gotten to where we are today and why certain things are the way they are. Enormous progress has been made over the years, even though it doesn't always feel like this on a daily basis. It is up to us to write the next pages of the fascinating history of ITER."